Stiff skin syndrome (SSS) is clinically characterized by stone-hard skin bound firmly to the underlying tissues, leading to a secondary limitation of joint mobility, often associated mild overlying hypertrichosis, and postural and thoracic wall abnormalities. First manifestations of SSS are usually observed between birth and early childhood with rock-hard skin that is most prominent in areas with abundant fascia such as on the buttocks and thighs, and the disease progresses until the skin of the entire body becomes fibrotic with subsequent growth retardation and joint contractures. SSS is a diagnosis of exclusion, with a distinctive clinical presentation without pathognomonic laboratory or pathological findings. 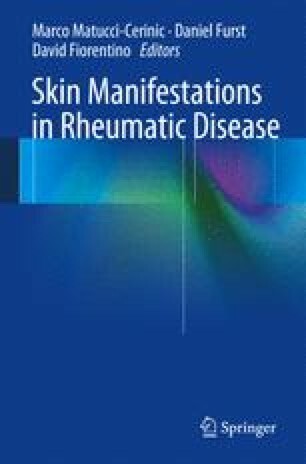 The clinical differential diagnosis of stone-hard and thickened skin areas includes systemic sclerosis, scleroderma, eosinophilic fasciitis, and scleromyxedema. In SSS patients, an overexpression of ECM proteins was detected, whereas no inflammatory infiltrates or upregulation of pro-fibrotic cytokines were found. Data in the literature suggest that fibrosis in SSS might be independent from inflammation. SSS exhibits a spectrum of histopathologic findings and different disease stages might also account for controversial results.